25 years later it appears on this artwork...I wonder what my 1988 Mac IICX would be worth now?! e babies...an Apple Mac Classic. You can see I am pointing it out at an art installation in Ingolstadt Art Gallery. The Mac Classic was a self contained little box with I believe was launched in 1990 to compete in the home market for under 1000 USD. It was bound to happen. And it did, on 1st March 2015. I'd like to say it was a dramatic high speed crash with a full 'yard sale' windmill of a wipe out. But sadly it was an innocuous first turn stumble going ever so slowly on a very steep off piste area. The result of slowly falling head over heels was that one ski did not release and in (not) doing so snapped the Anterior Cruciate Ligament (ACL) of my right leg. The result, is an ACL graft, and approximately 12 months of rehab. This post is one I never wanted to write, but it has to be done! Day one - I was taken by skidoo off the mountain to the local clinic where I was X-rayed, given an MRI scan and anti swelling drugs. Day two - went back to the clinic for my MRI results - and then sent to another specialist who advised immediate..
Day four - started rehab on a special machine that moves the leg slowly to gain range of motion. Day six - ditto....but with more movement. The end result is now almost three months to the day of surgery I am now walking again albeit not far, and have full range of motion. What I need now is to focus on rehab and physiotherapy. I am using Kate Stalker as my physo (see her website the Sporting Joint). I know its going to take a long time and obviously I am totally impatient. I cannot golf yet nor will I ski until the new year so scarily am almost 100% focussed on a mixture of design work and physio. 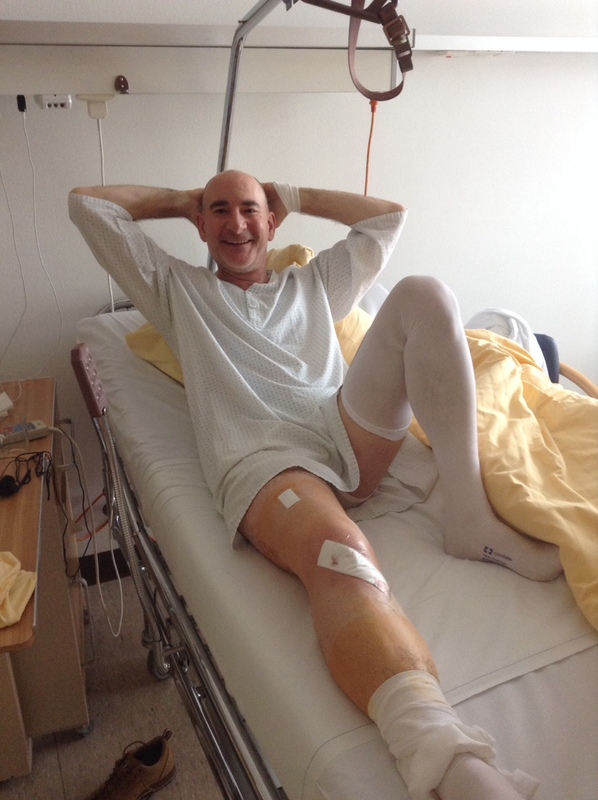 The photos show me in the hospital, my post operated leg and my knee in rehab. If you want to know more about ACL rehab or if you want a lovely new brochure or website, give me a call on 01332 291141 right now!